Shooting through the water in the final moments of a women’s 400-meter freestyle race held in Omaha, Nebraska, Leah Smith vividly remembers the rush of excitement as she realized she was about to qualify for the U.S. Olympic team. “I knew I was getting close, but I couldn’t let it distract me. I had to keep pushing until I touched the wall,” Smith said. Her concentration paid off. The University of Virginia fourth-year student-athlete finished the Olympic Trials race in 4 minutes, 0.65 seconds – the second-fastest time in the world in 2016, and fast enough to earn a place at the Olympic Games in Brazil. Smith kept that same determination as she headed to Rio de Janeiro – not only to succeed as an athlete, but also to make a longtime childhood dream come true. 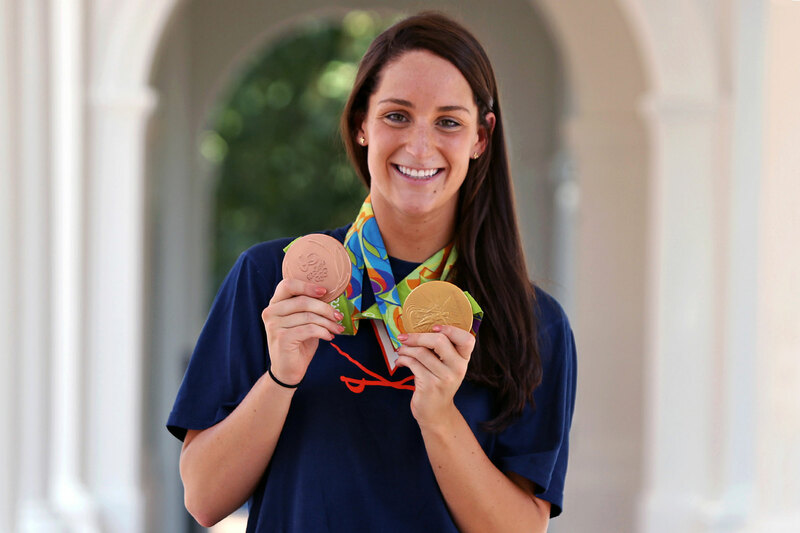 Although Smith may have been a rookie among some of the other seasoned Olympic athletes, her UVA studies helped her navigate the crush of media coverage in Rio with a savvy academic’s eye. The media studies major and history minor is a veteran of professor Siva Vaidhyanathan’s “Sports, Media and Society” course and has spent time researching the creation of major media phenomena. At the same time that she was getting a live case study in media phenomena, Smith was also helping to drive the U.S. Olympic team’s success in the pool. She ascended the podium twice in Rio, earning a gold medal as a member of the U.S. women’s 800-meter freestyle relay team and a bronze medal as an individual in the 400-meter freestyle. Upon returning to Grounds after her success in Rio, Smith put her elite competition experience to use in the classroom and the pool. Smith also sought to use her growing fame to inspire other young athletes. In February, she was honored for her accomplishments – which include four NCAA individual championships – at the National Girls and Women in Sports Day festival, an event co-sponsored by UVA’s Athletics Department and the Maxine Platzer Lynn Women’s Center. At the festival, Smith encouraged the many elementary and middle school-aged girls in the audience to forget about any artificial limitations the world may set for them. “I told them, ‘Never let the barriers that you think would stop you from doing something get in the way of what you think you can do,” she said. Smith used a personal barrier that had eluded her for a long time as an example. For years, it was thought impossible for female swimmers to break 4 minutes, 30 seconds in the 500-yard freestyle. Stanford University swimmer and fellow Olympian Katie Ledecky was the only woman ever to do so. Smith told the young women how close she’d come to breaking that time in the past and how she hard she was still trying to. Those who followed her progress in the weeks afterward would see her shatter it at last. At the NCAA Championships in March, Smith swam the 500 in 4:28. Head swimming and diving coach Augie Busch said that Smith’s determination has not only propelled her to success, but also helped bolster her fellow athletes to achieve at the highest level. Moving forward, Smith hopes to continue breaking records and pushing boundaries for female athletes. Smith has signed onto a career with USA Swimming and will remain in Charlottesville after graduation, where she’ll train between competitions. Poised to start life as a professional swimmer for the first time, Smith is excited to continue working with those who helped support her progress for four years.